See in Glossary method used when the AssetBundles were built (uncompressed, LZMA, LZ4). This function takes an array of bytes that contains AssetBundle data. Optionally you can also pass in a CRC value if you desire. If the bundle is LZMA compressed it will decompress the AssetBundle while it’s loading. LZ4 compressed bundles are loaded in their compressed state. However, this is not the only strategy that makes using LoadFromMemoryAsync possible. File.ReadAllBytes(path) could be replaced with any desired procedure of obtaining a byte array. This API is highly-efficient when loading uncompressed bundles from local storage. LoadFromFile will load the bundle directly from disk if the bundle is uncompressed or chunk (LZ4) compressed. 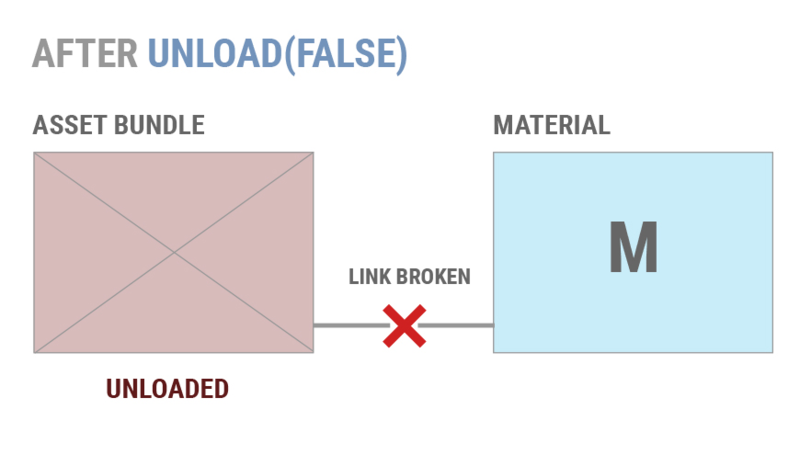 Loading a fully compressed (LZMA) bundle with this method will first decompress the bundle before loading it into memory. See in Glossary path. This is because the contents of that path will reside inside a compressed .jar file. Unity 5.4 and newer can use this API call with Streaming Assets just fine. This API is useful for downloading AssetBundles from a remote server or loading local AssetBundles. It is the older, and less desirable version of the UnityWebRequest API. Loading an AssetBundle from a remote location will automatically cache the AssetBundle. If the AssetBundle is compressed, a worker thread will spin up to decompress the bundle and write it to the cache. 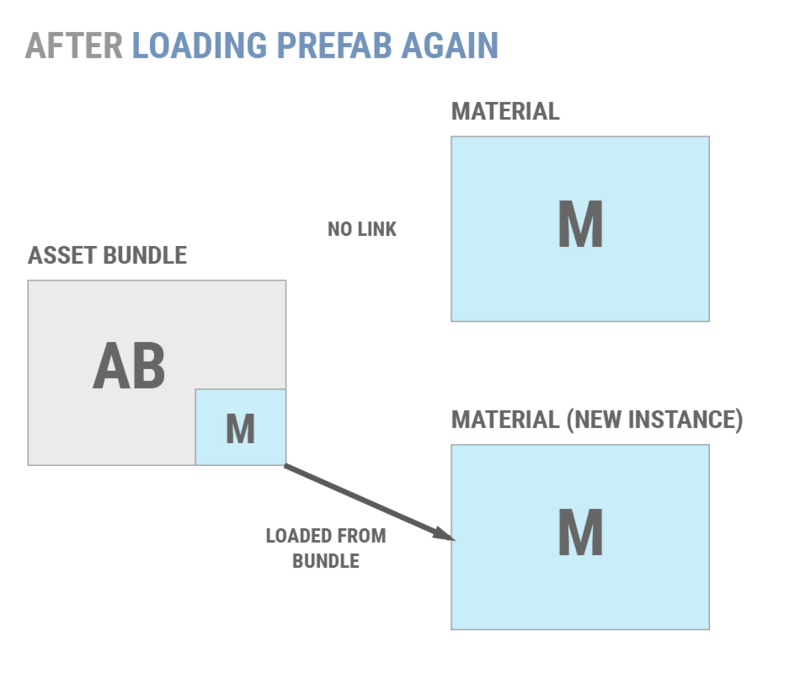 Once a bundle has been decompressed and cached, it will load exactly like AssetBundle.LoadFromFile. Due to the memory overhead of caching an AssetBundle’s bytes in the WWW object, it is recommended that all developers using WWW.LoadFromCacheOrDownload ensure that their AssetBundles remain small - a few megabytes, at most. It is also recommended that developers operating on limited-memory platforms, such as mobile devices, ensure that their code downloads only a single AssetBundle at a time, in order to avoid memory spikes. In order to force LoadFromCacheOrDownload the version parameter (the second parameter) will need to change. The AssetBundle will only be loaded from cache if the version passed to the function matches the version of the currently cached AssetBundle. The advantages of using UnityWebRequest is that it allows developers to handle the downloaded data in a more flexible manner and potentially eliminate unnecessary memory usage. This is the more current and preferred API over the UnityEngine.WWW class. Now that you’ve successfully downloaded your AssetBundle, it’s time to finally load in some Assets. T is the type of the Asset you’re attempting to load. There are a couple options when deciding how to load Assets. We have LoadAsset, LoadAllAssets, and their Async counterparts LoadAssetAsync and LoadAllAssetsAsync respectively. Once you have loaded your Assets you’re good to go! You’re able to use the loaded objects as you would any Object in Unity. Loading AssetBundle manifests can be incredibly useful. Especially when dealing with AssetBundle dependencies. To get a useable AssetBundleManifest object, you’ll need to load that additional AssetBundle (the one that’s named the same thing as the folder it’s in) and load an object of type AssetBundleManifest from it. Now you have access to the AssetBundleManifest API calls through the manifest object from the above example. From here you can use the manifest to get information about the AssetBundles you built. This information includes dependency data, hash data, and variant data for the AssetBundles. 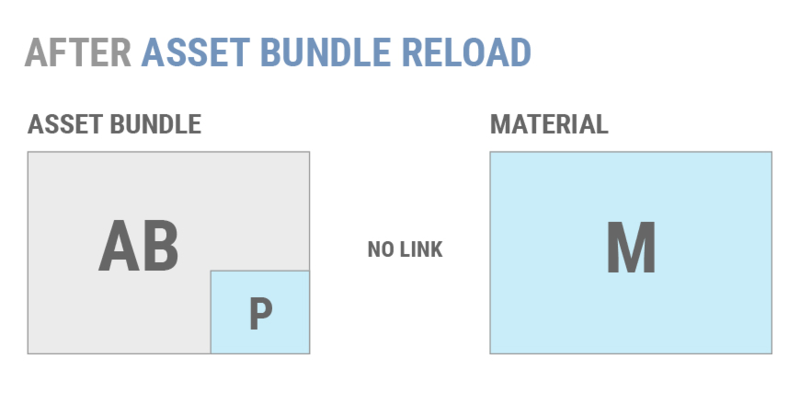 Remember in the earlier section when we discussed AssetBundle Dependencies and how, if a bundle had a dependency on another bundle, those bundles would need to be loaded in before loading any Assets from the original bundle? The manifest object makes dynamically finding a loading dependencies possible. Let’s say we want to load all the dependencies for an AssetBundle named “assetBundle”. string dependencies = manifest.GetAllDependencies("assetBundle"); //Pass the name of the bundle you want the dependencies for. Now that you’re loading AssetBundles, AssetBundle dependencies, and Assets, it’s time to talk about managing all of these loaded AssetBundles. See in Glossary. Asset cleanup is triggered at specific times, and it can also be triggered manually. It is important to know when to load and unload an AssetBundle. Improperly unloading an AssetBundle can lead to duplicating objects in memory or other undesirable circumstances, such as missing textures. AssetBundle.Unload(bool); and if you should pass true or false into the function call. Unload is a non-static function that will unload your AssetBundle. This API unloads the header information of the AssetBundle being called. The argument indicates whether to also unload all Objects instantiated from this AssetBundle. AssetBundle.Unload(true) unloads all GameObjects (and their dependencies) that were loaded from the AssetBundle. This does not include copied GameObjects (such as Instantiated GameObjects), because they no longer belong to the AssetBundle. When this happens, Textures that are loaded from that AssetBundle (and still belong to it) disappear from GameObjects in the Scene, and Unity treats them as missing Textures. Let’s assume Material M is loaded from AssetBundle AB as shown below. If AB.Unload(true) is called. Any instance of M in the active scene will also be unload and destroyed. If you were instead to call AB.Unload(false) it would break the chain of the current instances of M and AB. If AB is loaded again later and AB.LoadAsset() is called, Unity will not re-link the existing copies of M to the newly loaded Material. There will instead be two copies of M loaded. Generally, using AssetBundle.Unload(false) does not lead to an ideal situation. Most projects should use AssetBundle.Unload(true) to keep from duplicating objects in memory. Having well-defined points during the application’s lifetime at which transient AssetBundles are unloaded, such as between levels or during a loading screen. Maintaining reference-counts for individual Objects and unload AssetBundles only when all of their constituent Objects are unused. This permits an application to unload & reload individual Objects without duplicating memory. If you’d rather not manage loading Asset Bundes, dependencies, and Assets yourself, you might find yourself in need of the AssetBundle Manager.